Rubbish that people leave in the forest, such as bottles, not only spoils the landscape, but can also be a death trap for small animals. Rodents, lizards and numerous insects die in them, say scientists who have checked the scale of this problem in Polish forests. "Littering is a common practice. Even the introduction of a new littering law has not solved the problem. Polish people litter a lot, and masses of dangerous waste goes into the environment. You can see bottles and drink cans almost everywhere - from roadside ditches to parks, forests to ponds and lakes. Their environmental impact may be greater than it seems" - notes Krzysztof Kolenda from the Institute of Environmental Biology of the University of Wrocław, who studies the impact of rubbish on fauna. The study conducted in the area of Ostrów Wielkopolski (in three suburban forests and near the pond on the outskirts of the city) allowed to assess the scale of the threat that ubiquitous garbage in the forests poses for small animals. Krzysztof Kolenda and two students from High School No. 2 in Ostrów Wielkopolski collected 254 containers. In 111 of them, they found as many as 1465 dead animals, representing 51 different taxonomic groups. Beetles (including scarabs, ground beetles and silphids), flies, molluscs and isopods dominated among the animals trapped in the rubbish. There were also the remains of 14 vertebrate from five species. Four identified species - two species of shrews and two species of ground beetles - are protected in Poland. Together with zoologists from the Adam Mickiewicz University in Poznań (Magdalena Przybył, Barbara Piłacińska and Leszek Rychlik) Krzysztof Kolenda also checked whether the search of rubbish can be a good way to assess the species composition of mammals living in a given area. The results of the study have been published in the Polish Journal of Ecology (10.3161/15052249PJE2018.66.1.006). "On two research plots, we collected data on the occurrence of small mammals using two methods: the traditional method of trapping animals in live traps, and collecting rubbish(bottles and cans) from the same area. It turned out that although only less than 5% of waste contained vertebrate remains, this +bottle method+ is quite effective, we have detected 10 species of mammals, while we have found only six of them with traps" - says Krzysztof Kolenda. The authors of the study believe that while this method of estimating fauna has its limitations (there is not enough garbage everywhere) - it can be successfully used in urban and suburban forests, where people litter a lot. But why do animals so eagerly enter containers and sentence themselves to death? According to scientists, they are attracted by the smell of decomposing beverages. "While inside, it`s difficult for them to climb the sloping and damp wall to get out of the bottle, so the first insect dies of hunger, dryness or drowning. Its decaying corpse lures curious scavengers - and a large group of dead animals can end up in the bottle in a short time" - says the scientist. Dark, glass bottles with small openings (like beer or wine bottles) may also be considered a good hiding place. For that reason, they very dangerous for small vertebrates. "These bottles, due to the dark colour, may resemble a burrow. The animal will eagerly enter it, but getting out may be a problem, and the potential burrow becomes a trap" - says Krzysztof Kolenda. Sometimes it may seem that animals use rubbish for their benefit. Scientists have found stocks of seeds in some bottles - which suggests that small vertebrates treat them as "granaries". 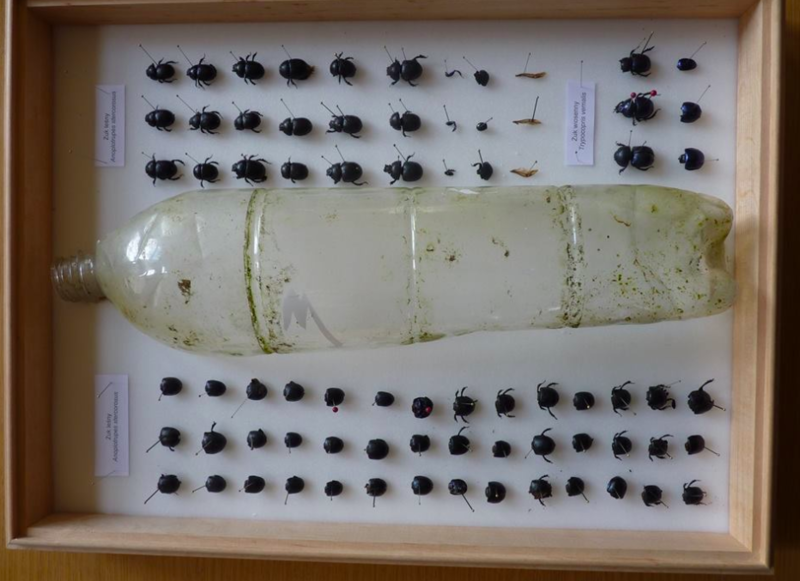 In two bottles, scientists found anthills: soil was brought inside and there was a system of tunnels, eggs and live ants. Bottles can also be used by spiders, which set up nets on the openings and hunt. But taking into account the multitude of possible shelters in the forest, bottles are a greater threat than attraction for animals, says Krzysztof Kolenda. When the container is dry, all is well. But only until the rain falls.